If Microsoft had decided to get me not to buy Crackdown 3 (I'm a big fan of the series), I don't think they could have done any better than this trailer. Maybe it will please others, but personally I hope it's not really representative of the game's core gameplay and atmosphere. BlimBlim, I absolutely agree with you. Like I said in the "What's up?" chat window, I'm a huge fan of Crackdown. 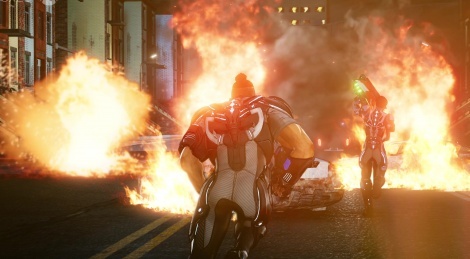 I loved Crackdown 1, and even like Crackdown 2 a lot - it always put a smile to my face, in spite of allits faults, it was still very fun to play it. But this trailer was bad and didn't show anything that looked good. During the livestream, halfway through the trailer, I even thought to myself how bland and outdated some things looked. The guns' sound effects, visual effects, the running, throwing the cars, etc. It all looked, sounded and felt just like Crackdown 1 and 2. Which isn't a bad thing in of itself, but there's no sense of "evolution". Like if they just decided to make a carbon copy with almost no alteration other than better graphics. Instead of adding more systems, changing the formula enough that you feel like the game improved. It's Crackdown 3, not Crackdown 1.5. That's what my main disappointment is with the game as seen in the trailer. I really, really hope this is just a case of a really bad trailer making the game look really bad. But the fact that Microsoft took so long without showing anything new and the game's marketing is almost non-existant, means that Microsoft itself doesn't have much confidence in the game. Which never bodes well. To put it into perspective, both Scalebound and Fable Legends had far, far more marketing behind them and far more presence in Microsoft's events than Crackdown 3. And both were cancelled late in development. Kind of how I felt when I first saw Gears 4. Its definitely more Gears which is good, but they could have tried mixing things up a little here and there. Gears also kind of suffered from the "I wish this was more impressive looking" thing that is going on here. True, but it's not just visuals. Wish while not very good, aren't bad either. It's more like gameplay mechanics refinements. Things you would expect when going from a previous game to a sequel. Specially a sequel over 10 years later than the original. Of course, none of us have played the game. So we can all just be having a "bad impression" of the game. And when it comes out, it will be great. I guess we better wait for "Hands-On" previews from gaming press to see if they feel the same after playing the game. Anyone know if Crackdown 3 will be playable on the show floor? My guess is that the destruction is gone. The power of 'the cloud' just doesn't exist. I think that is the reason why we haven't seen anything from C3 since the tech demo. you'd be wrong. the game is made by 2 developers, the single player lacks the destruction seen in the MP. but the MP is still using the cloud and has heavy destruction. this has been known from the start. sadly i have no interest in the MP. and the single player portion looks like a turd. this is very likely to be my disappointment of the show. I think the game is likely 90% MP focused, and likely will be a ton of fun in that mode. The game still has lots of promise, but all of that promise hinges on the MP being incredible. This single player campaign looks completely throwaway. Oh, that is my bad. I thought the 2 were interconnected. So, if I understand correctly, they made 2 seperate games. what i think happened is this. the initial idea behind xbox was this always connected, cloud powered system, and crackdown was being developed with that in mind. Reagent Games/cloudgine was going to make the entire thing, and it was all going to have the destruction allowed by the cloud processing. then the U-turn happened and the xbox suddenly needs a SP component that can be played offline. so they hire sumo digital to make the single player portion of the game but because it's no longer being buffed by cloud magic, it's a much more stripped back level of destruction. i imagine when they show more of the MP it'll be impressive, at least in regards to destruction (i still think visually it's doing to underwhelm for consistencies sake) but SP seems like a panicked afterthought at this point sadly. Well, we have only seen a tech demo of the MP in C3. Ever since, nothing has been shown. I never believed 'the power of the cloud'. I think it just doesn't work or just doesn't exist. I know that 'the cloud' is used to store info in Forza games, but other than that, I don't know of any game that has been advertised as a cloud powered game. we've seen examples of it in various forms, it's just never been sold as some huge deal before. i mean all it is is server side computation. like an MMO or even something like the wave system in battlefield. it's all done so everyone in the server is seeing the same thing. i mean, you're online anyway since your playing MP, you're in a server that's doing all the building damage calculations off-site. i fully expect it all to be there like it was shown before. No destruction in single player, really? What a letdown. I mean I get it, it'd be hard to design a game around that, but come on, it was the game's only real selling point. There's no way they can make an entire city destructible in a single player game. Yet both Red Faction 1 and 2, had almost all environments destructible back in 2001 and 2002, respectively. Granted that they were FPS and linear games. However, both Red Faction: Guerrilla (2009) and Red Faction: Armageddon (2011) were open-world and had almost every building be destructible. As well as vehicles, objects, etc. That was the whole appeal of the Red Faction franchise. I understand that it might be hard, but there have been many games with destructible environments before. And most were Single Player games. Even Grand Theft Auto 5 had a few destructible environments. Same for Battlefield: Bad Company 1 and 2, and Battlefield 4 with the "Levolution" mechanic. It's not something new or extremely hard to do. Though I do agree that the developers probably built the engine around Microsoft's Cloud service, and when that didn't work out, it was probably too late into development to make any radical changes. The thing with red faction is the destruction isn't actually a particularly gameplay changing event. Enemies were never in or on buildings, nor where any objectives. The destruction was just window dressing. Cool window dressing but window dressing non the less. Crackdown tends to have entire gangs and bosses on rooftops, collectible agility orbs all over the place, i think it would either need a fundemental change to even basic things like enemy placement to even remotely work and it would suffer for it. Complete destruction sounds great on paper but not when you can kill an entire gang by blowing up the building they're all stood on in 3 seconds or you accidently destroy a chimney stack preventing you from getting that final collectible agility orb.